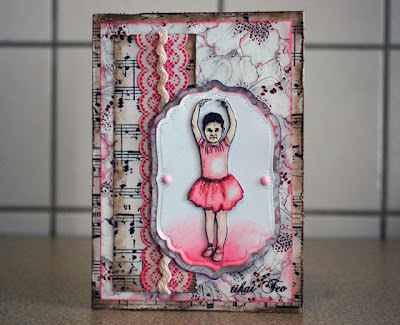 Livas crafts: Aleksa - The Ballerina! If little sister gets to be turned into a stamp, oldest sister has to be as well... So I took one of Aleksa's favorite pic and turned it into a stamp. Ballerinas - that means pink, pink and pink - oh yes - and glitter as well :) All I remember from ProMarker usage, is that about pinks - Antique pink, Cocktail pink and Pale pink and they goes so well with Worn Lipstick Distress ink! I wanted to emphasize embossed border from Labels 4 die, so did some piercing, but only in curves and corners not all around the edge. As I din' t have light pink gems, I went for Viva liquid pearls on both sides of my little ballerina. All papers are printed with my Epson printer, but the floral patterned paper is of my own make. Even thou girls here in Latvia uses it pretty often, this is actually the first time I use it myself. Edges of paper with music notes are distresses and inked with Frayed Burlap Distress ink. Small sentiment in the down right corner says "just for You"
Beautiful card, great layering and that image is gorgeous, thanks for joining us at Allsorts this week and good luck! Great card - lovely girly colours and super image. Thanks for playing Free & Easy with us at Allsorts this week. Very pretty card Thanks so much for playing at the Emerald Faeries Garden challenge Blog Good Luck. Clean And Simple (CAS) - Can I Do It?